Discussion in 'Houston Rockets: Game Action & Roster Moves' started by Philter_09, Feb 17, 2019. Should we sign Ray Allen on a 10 day contract? Really? This is the best we can do? We'll sign him too some day! BaselineFade, CriscoKidd, juanm34 and 9 others like this. I’m usually optimistic, and I’m not sure how this gonna go. He may be just bench support. I’m usually optimistic, and I’m not sure how this gonna go. He may be just bench support... coaching our guys how to be clutch 3pt shooters. Just the 3/4 player we need. He is 3/4's the player he was when he retired. clutchdabear, topfive and saleem like this. Have to sign someone to get to league minimum roster. It's been reported that the Rockets would probably sign someone to a 10 day contract. Maybe Bullard will be next, he already travels with the team and knows the offense. seeingred, ak99999, deb4rockets and 16 others like this. Wait is it April already? chadyang, clutchdabear, cbs1507 and 2 others like this. Seeing an AWESOME retired player play during the celebrity All Star game does not get me excited. It makes me as the question WTF? If he wants to see if he wants still play I would absolutely give him 10 days to figure it out. Yep, better than anyone else. It's a sad state of affairs to say the least. He still has got great form on his shot, but he is too old now. I don't think he will try to come back. It's all Morey here. He is not using his mind. He can shoot 3 for sure. Morey get it done. We still need 3 players. He can teach harden and cp3 how to get champion using his experiences. jamisonrocket, FLASH21, BaselineFade and 28 others like this. dkim1984, BigShasta, alethios and 4 others like this. He isn't joking about Thabeet though. It doesn't matter if the Raptors and the Pistons are considering him to me. Who cares if he watches the guy work out? Honestly, who gives a fuuck? Obviously, Thabeets agent called a workout knowing all the exec's would be around. It absolutely does no harm for morey to watch the guy. Likely all 3 teams are just doing it as a favor. jacoby, Nook, alethios and 4 others like this. it was a joke on twitter. Morey being affable. dachuda86, BigMaloe, harold bingo and 4 others like this. It was a joke but Ray Allen shoots better than our role players even in retirement. dachuda86, AroundTheWorld, TheRealist137 and 1 other person like this. 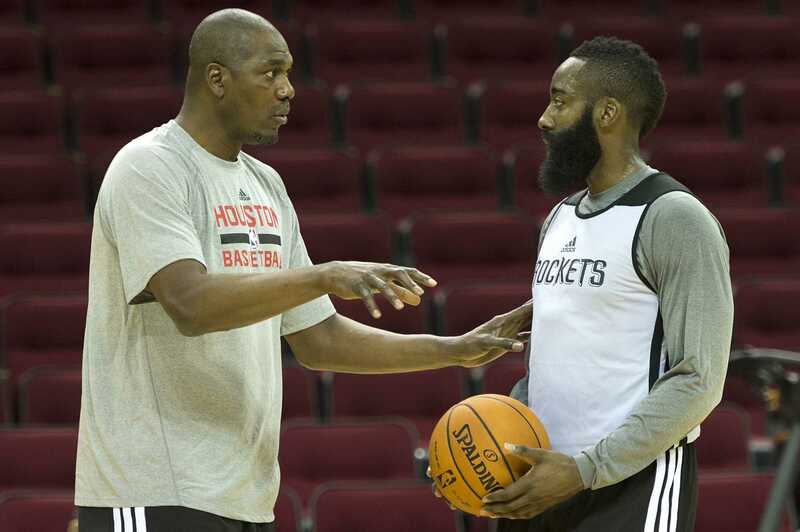 Give Hakeem five minutes a game. waytookrzy079, BaselineFade, JuNx and 11 others like this.